Also known as Stinging Nettles, and for good reason. Nettles contain hundreds of hollow needles that inject histamine that causes a stinging sensation when it comes in contact with your skin. Wear gloves when handling raw nettles. Cooking nettles removes the stinging chemicals from the plant. 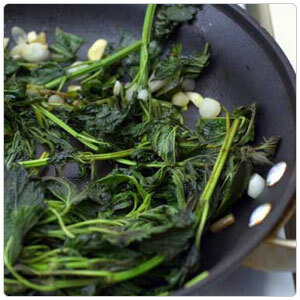 Cooked nettles are similar in flavor to spinach and can be used in pastas, soups, sauces and as a vegetable component.